We are having a one week school break next week, I'm always happy to turn my alarm off, lol. 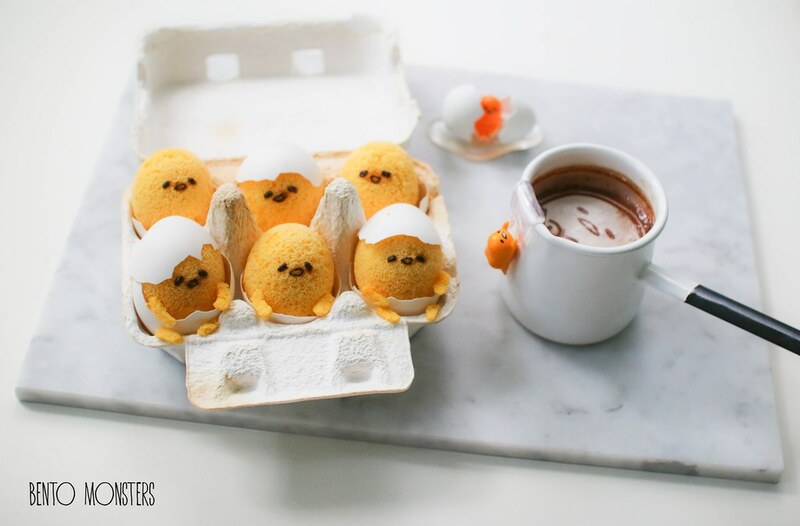 I probably won't be making much cute food next week, I hope I still have time to make more Easter creations when school starts again, but meanwhile, you can check out my past Easter creations over here. 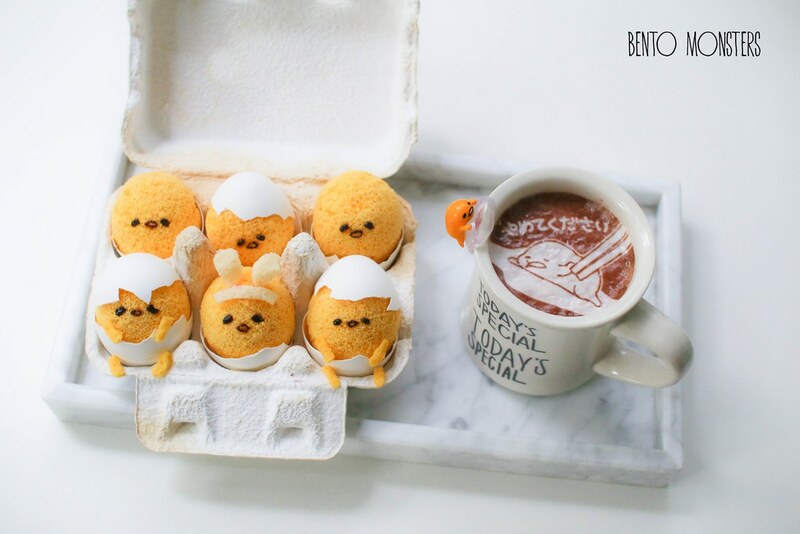 The first Easter creation I made this year are these Gudetama chiffon cakes. This silly egg is still one of my favourite character, lol. 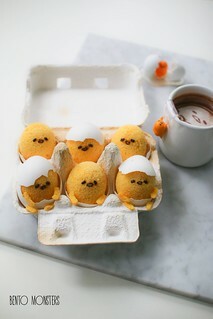 They were baked in egg shells. The troublesome part of this recipe for me is to collect the egg shells, I can only bake these after I've collected enough egg shells. 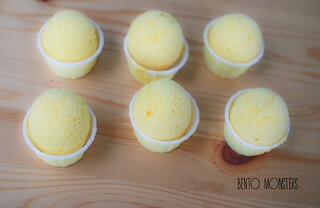 I like the light airy texture of chiffon cakes, they are also healthier than the usual cakes as well. These are lemon chiffon cake, if you want to make plain ones, just substitute the lemon juice in my recipe with milk or water, and lemon zest with vanilla extract. You will need a little yellow food gel colouring, so that the cakes turn out yellow in the end, else they will turn out white instead. 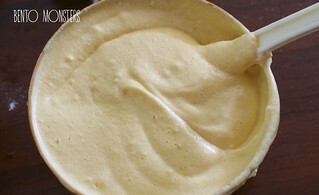 Alternatively, you can replace food gel with lemon or orange emulco, if you prefer. 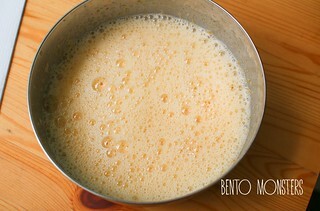 Prepare egg shells by using a spoon to gently crack the narrow end of the egg, make a hole and drain the contents. 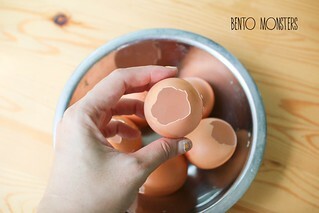 Remove the white membrane inside the egg. 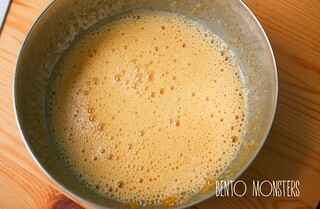 Prepare (A), whisk egg yolk and sugar together till sugar melts. 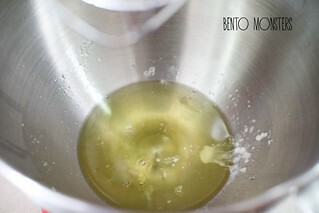 Add in lemon juice, oil, salt and lemon zest and mix well. 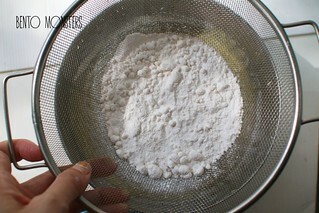 Sift in cake flour and mix well. 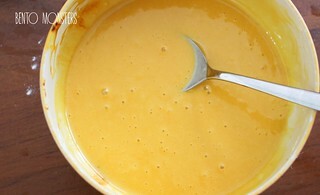 Add in yellow food gel colouring using a toothpick, mix well, make sure the colour is a shade or two darker than the eventual colour you want, as the batter will be lighter after mixing in (B). Set aside. 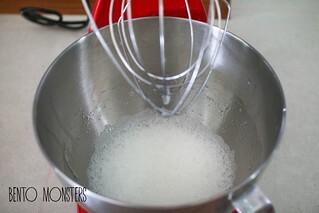 Prepare (B), whisk egg white with cream of tartar for 1 minute, then gradually pour in sugar and continue to whisk till firm peaks. 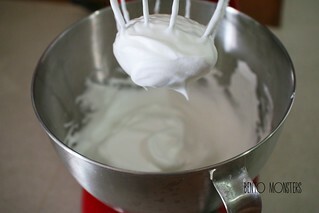 Gently fold mixture (B) into (A) one third at a time. 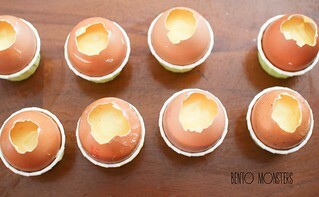 Place egg shells in cupcake cases, so that they can stand upright. 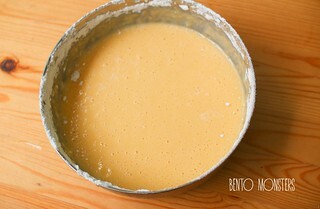 Fill 12 egg shells with batter till around 2/3 full. 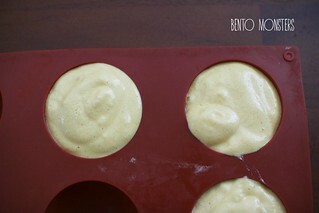 Pour the remaining batter into muffin cups or mould (these will be used to cut out Gudetama limbs). Bake at 150C for 15minutes or when a skewer inserted comes out clean. 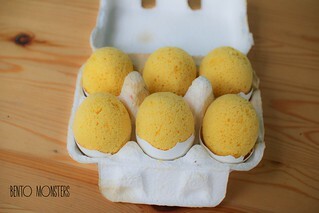 Let cakes cool down completely before cracking and peeling off the egg shell slowly. 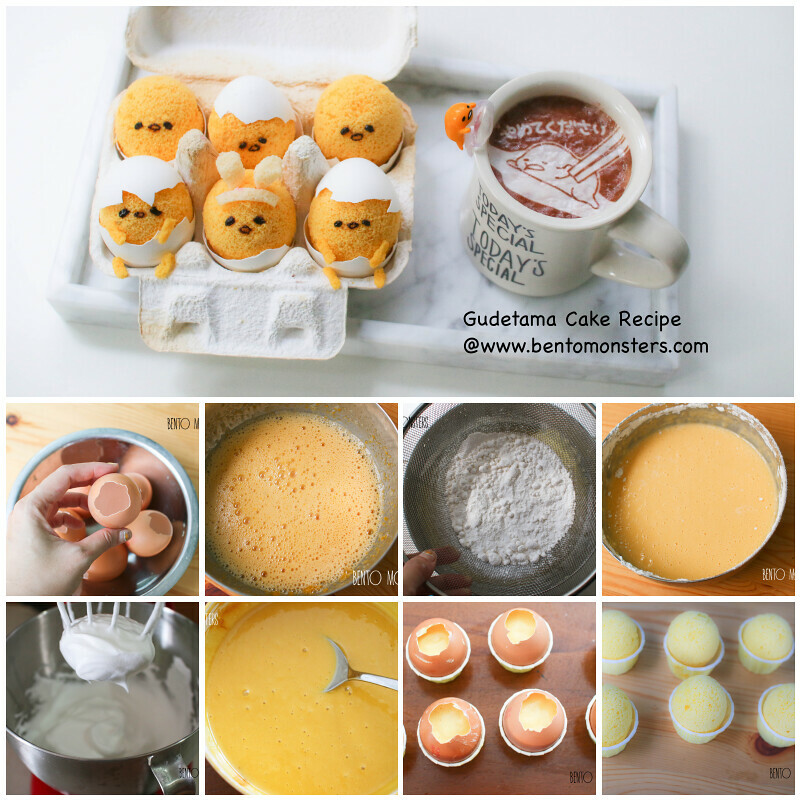 Remove cake from mould and use knife to slice out the cake, then use a pair of scissors to cut out Gudetama limbs and attach on using some melted white chocolate. 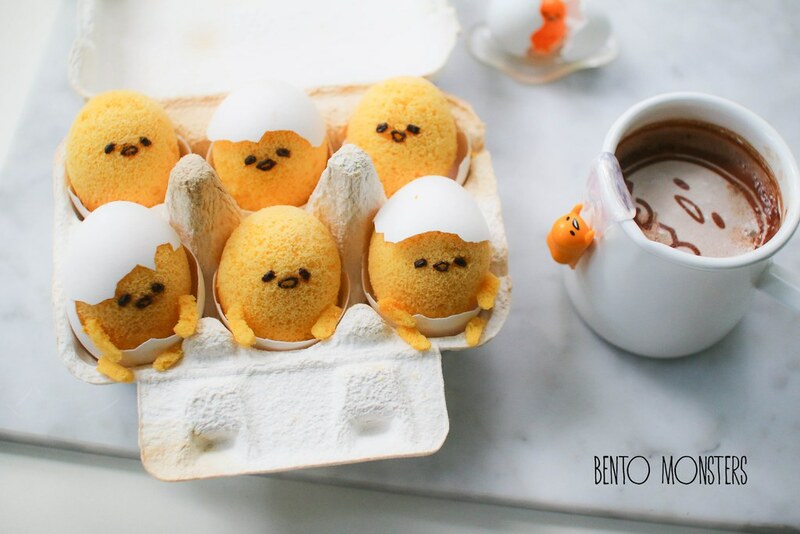 Use melted dark chocolate to draw on Gudetama's features. Great festive idea~~They are really cute!!! These are the most adorable chiffon cake I've ever seen! Thanks for sharing the recipe! hi..can I use other oil to replace canola oil? Yes, any vegetable oil will do. 1/8 tsp cream of tartar mean how many gram? less than 1g, just need to add very little, you can add a pinch too. 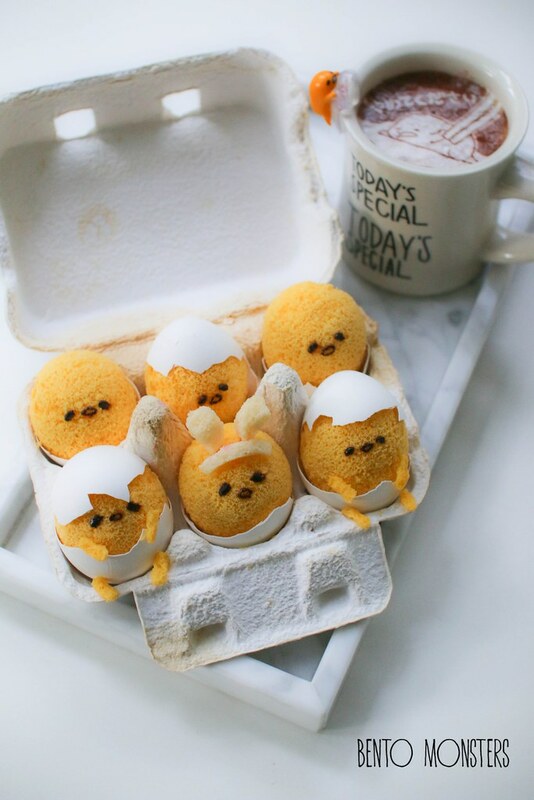 Ahhhh these are super duper cute and creative! HI Ming, Can i know what do you use to draw on the eyes and mouth. Yours look so neat and sharp. Hi Ming, Can i know what did you use to draw the eyes and mouth? Your gudetama features look so neat and sharp.